My name is Pranav M Karve. Please visit my webpage to learn more about me. My name is Ying-Chuan Chen. I graduated from National Taiwan University in Taipei, Taiwan with B.S. and M.S. degrees in Civil Engineering. I joined UT in the fall of 2013 and my research advisor is Dr. Manuel. My research topic is related to the reliability of high-mast illumination poles under wind-induced vibrations. My name is Heedong Goh. I received B.S. and M.S. degrees in Civil engineering from Seoul National University. I joined MUSE in the fall of 2012 for a Ph.D. degree under the supervision of Professor Kallivokas. My research involves the design of structures for seismic isolation using ideas from metamaterials, cloaking and band gaps. I'm also working on time reversal concepts for energy focusing and the inverse medium problem for damage detection and/or erosion in dams. I graduated from the Indian Institute of Technology, Guwahati with a major in Civil Engineering and a minor in Mechanical Engineering. 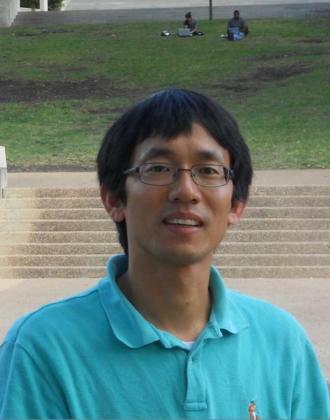 I joined UT in fall 2014 and my advisor is Prof. Lance Manuel. My current research focuses on generating environmental contours using Inverse First-Order Reliability Methods. Besides research, I like cooking and reading Indian history and politics. My name is Sedef Kocakaplan. I received my Master's degree in Earthquake Engineering from Bogazici University, Kandilli Observatory and Earthquake Research Institute (KOERI) under the supervision of Prof. Dr. Erdal Safak. We developed two methods to identify and calibrate analytical models of multi-story buildings from their vibration records. I joined UT Austin in Spring 2015 for a PhD degree and my research advisor is Dr. Manuel. My name is Seungbum Koo. I graduated Seoul National University in South Korea with B.S. and completed M.S. in structural engineering from UC Berkeley. I joined in UT in the fall of 2010 and my research advisor is Dr. Kallivokas. My current research topic is the application of time-reversal concept for focusing wave energy in a subsurface formation. My name is Jinsong Liu. I graduated from Shanghai Jiao Tong University with a B.S. degree in Naval Architecture and Ocean Engineering. I joined UT in the fall of 2013 and my research advisor is Dr. Lance Manuel. My current research topic is related to the modeling and simulation of a floating offshore wind turbine. My name is Nan-You Lu. I graduated from National Taiwan University in Taipei, Taiwan with a B.S. and M.S. in mechanical engineering. I joined UT in the fall of 2014 and my research advisor is Dr. Manuel. My research topic is related to the modeling and simulation of thunderstom microbursts and their effects on wind turbines. My name is Hamidreza Mashayekh. I graduated from University of Tehran in Iran with B.S. and completed my M.S. in Geotechnical engineering from KNTU of Iran. I joined in UT in the fall of 2010 and my research advisor is Dr.Kallivokas. My current research topic is the response of soils with different mechanical properties to moving dynamic load recorded by moving sensors. My name is Jae Sang Moon. I got my B.S. and M.S. degrees at Seoul National University in South Korea. My topic for my M.S. thesis was reliability-based design optimization of vibration control. I joined the University of Texas at Austin in the fall of 2010 and my research advisor is Dr. Manuel. My current research involves the simulation of wakes in wind farms and their effects on turbine loads. My hobbies are playing tennis and pingpong and dancing. Please visit my webpage to learn more about me. Please visit my website to learn more about me. I graduated from the University of Pune (India) with a B.Eng. degree in Civil Engineering. I then worked as a Construction Engineer with a firm in India for 2.5 years. I joined UT in the Spring of 2014 and my research advisor is Dr. Lance Manuel. I am currently working on modeling and analysis of offshore wind turbines. My name is Janaki Vamaraju. I graduated from Birla Institute of Technology and Science, Pilani, India with a B.E in Civil Engineering and M.Sc in Mathematics. I joined UT in Fall 2013 and my research advisor is Dr Kallivokas. My current research topic is related to 2D imaging of soil domain using SASW, MASW and full waveform inversion methods. Besides research I enjoy trying different cuisines, dancing and reading literature on Indian and western philosophy. My name is Jiaqi Wang. I obtained my B.Eng. degree in Ocean Engineering from Tianjin University in China. I joined the University of Texas at Austin in the fall of 2014 and my M.S. thesis advisor is Dr. Manuel. My current research is related to extreme loads on a wave energy device. Our group's broader expertise is in mechanics, uncertainty, and computational modeling. Our research focuses on select problems, often multi-disciplinary in nature, whose solution requires the synergy of applied mechanics, applied mathematics, reliability and stochastic analysis, computational simulation, and/or physical experiments. Our work is primarily driven by the need to understand physical processes, and a desire to provide engineering solutions to problems affecting quality of life. We take pride in our graduates and their accomplishments, for, through research and teaching, they are indeed our finest product.